Is there a character to appear on film in more variations that Sherlock Holmes? Probably not. Holmes even makes James Bond seem like a model of cinematic consistency. Getting a new edition of the ol’ detective out there is even harder these days. After all, we just got two radical (both in the “wildly different” and “Ninja Turtle adjective” sense of the word) re-interpretations in Robert Downey Jr.’s action hero version and the particularly Cumberbatchian rendition over on the BBC. This time the folks behind Mr. Holmes are going for a completely different and completely unsexy peek into the man beneath the hat. 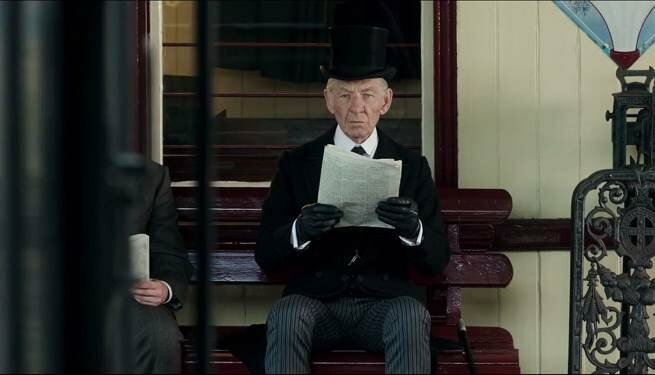 Ian McKellen stars as an old, cranky, and slightly senile Holmes in a movie that is at best an intriguing humanization of the crime-solving icon and at worst, expensive fan fiction. Director Bill Condon (Candyman: Farewell To The Flesh and some Twilight sequels) plays out his Sherlock Holmes tale across a few timelines. At the forefront is a 90-something crumbling Holmes in 1947. He’s isolated himself in a country cabin where he tends to bees, bickers with his housekeeper (Laura Linney), and struggles to remember his own past for the benefit of her son (Milo Parker). In an intriguing twist, this Holmes was both a real person and semi-fictional icon, with Dr. Watson (never given a face) dressing up their cases and selling them to pulp magazines. Holmes attempted one final case after Watson’s departure and the results emotionally scarred him so severely that he had to quit. The only trouble is that he can’t remember why. As that story plays out with a far more spry McKellen in the background and impacts the dying Holmes in the foreground, there’s also a third story about Holmes going to Japan to try and find a special memory aid pulled from the ashes of Hiroshima (which is easily the weakest part of the film, so this is the last time it shall be mentioned). The name of the game here is to try and find the man beneath the pop iconography, so it should be perfect material to reunite Condon and McKellen who pulled the same trick on their wonderful depiction of the life and contradictions of Frankenstein director James Whale. Unfortunately, this soft peddling awards bait picture doesn’t dig nearly as deep. Though I suppose since this tale is entirely fictional, perhaps that’s appropriate. The best part of the movie is easily Ian McKellen, who carries the entire endeavour on his shoulders. Caked in old-age makeup as the dying Holmes, McKellen reveals great pain and anguish through the smallest of movements and moments. As the aging but active younger Holmes, McKellen offers more of the bounce and playful inquisitiveness one regularly associates with the character. That flashback narrative climaxes with a remarkable moment as Holmes’ typical crime solving catches a woman in a lie, only to have her reveal the reality behind her lie and call out the great detective for his own personal failing that rings painfully true. As that happens, McKellen subtly shrinks from a literary hero into the damaged old bitty scene elsewhere and it’s a truly extraordinary scene. Unfortunately, it’s only really that one scene that’s extraordinary in what is otherwise a pretty mediocre movie. Condon shoots it all through an indistinctly soft-focused and prestigiously bland style that makes the movie feel more like melodrama than pulp. The mother/son team surrounding Holmes in his dying days are so painfully underwritten that they are hard to take seriously. The young boy is precocious with virtually no other qualities, while the housekeeper is such a stereotypically whiney woman that it’s an insult to an actress as immensely talented as Linney that she was saddled with the role. Aside from the “last case” flashback, everything in the movie is woefully predictable, which is one quality no Sherlock Holmes caper should ever have. Ultimately, this is a hokey little movie about the perils of aging that would be shoved onto Lifetime were it not for the fact that the old man at the center is Sherlock Holmes and he’s played beautifully by Ian McKellen. 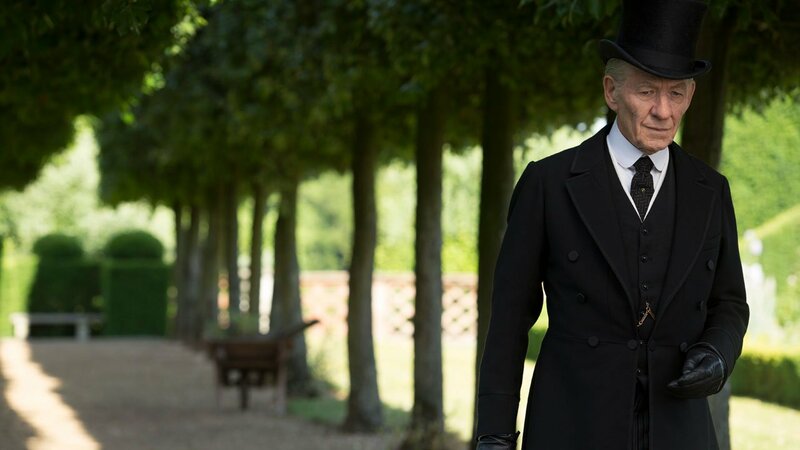 Whether or not you want to see Mr. Holmes comes down entirely to whether or not you want to see Ian McKellen play Mr. Holmes. That’s really all this movie has going for it, but thankfully it’s worth the investment for those who are interested and can keep their expectations in check. Sherlock Holmes gets the prestige movie treatment in this soft-hearted slice of Oscar-bait that feels like glossy fan fiction.